We know it seems too hot to talk about “Coats,” but please keep us in mind as the weather cools. It’s almost time for our 4th Annual 1000 Coats for Hope coat drive. Last year we set another coat collection record with more than 3600 cold weather items. This year we hope to break last year’s amazing record and collect over 4000, starting Saturday, October 18 and ending Saturday, November 1. We need kids’ sizes more than anything, but all sizes will be accepted, new or gently used. If your group would like to be a collection point for coat drop offs in your neighborhood, let us know so we can add you to our website. Use the convenient online contact form or call Reverend Flowers at 214-942-6110 or 469-879-3238. Click Here For More Information! 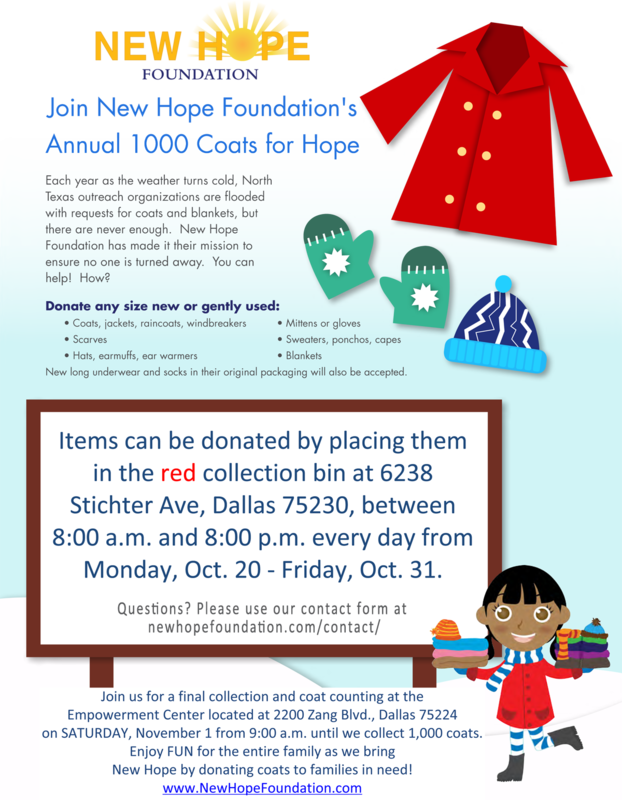 We still need coats, especially for children and infants! Drop off at Sewell Buick GMC at 7474 Lemmon Ave. through December 14, 2013. We have already collected and distributed more than 1,500 coats and jackets so far this year, but there is still a need for new and gently used coats, jackets, sweaters, and sweatshirts, especially for children and infants, sizes 12 Months up to 5T and Youth 5/6 – 12. 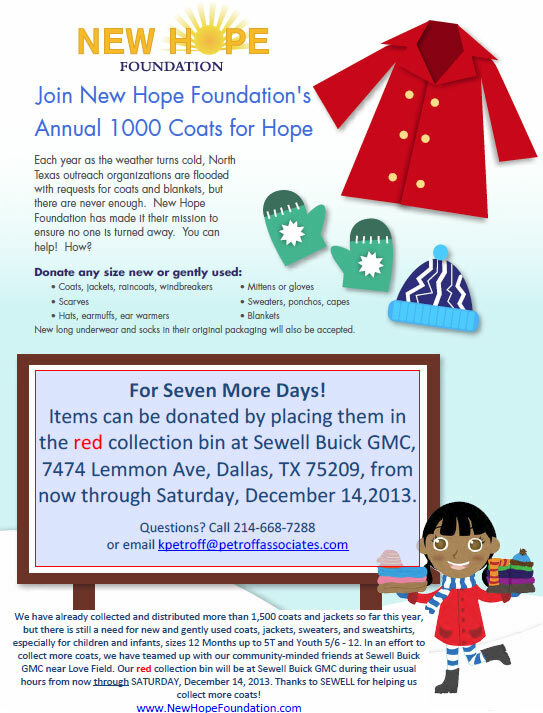 In an effort to collect more coats, we have teamed up with our community-minded friends at Sewell Buick GMC near Love Field at 7474 Lemmon Ave, Dallas, TX 75209 (map). For Seven More Days! Our red collection bin will be at Sewell Buick GMC (map) during their usual hours through SATURDAY, December 14, 2013. Thanks to SEWELL for helping us collect more coats! 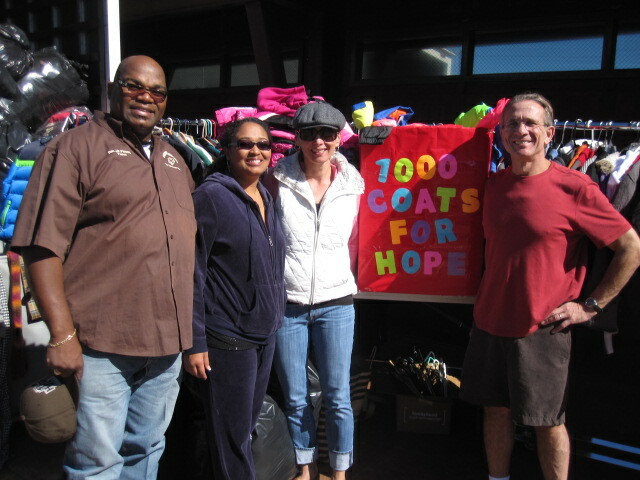 Our third annual 1000 Coats for Hope Coat Drive was a huge success! Comments Off on Our third annual 1000 Coats for Hope Coat Drive was a huge success! Blessed with a beautiful, sunny day and a wonderful network of over 100 individual and company donations, we collected 1,352 coats and jackets this year. The donations came from as far away as Evergreen, Colorado, and as close as the Wynnewood Apartments right next door to the Empowerment Center. Individuals who donated to our Coat Drive are too many to mention, but new coats and/or large numbers of coats were donated by the following: Angela Knight Beth Howard, CSR Bishop Dunne Alumni Club Bishop Dunne Catholic School Brian Angell Brian Loncar & Associates Colleen Campbell & Katie Campbell Ed and Brenda Krieger Frame House Outreach Foundation Jay Hull Maxine Helfman Parish Episcopal High School Sedgwick Law Firm, LLP Soul Rydaz Riding Club Steve Wentz The Campbell Agency The Dallas Round Table The Notre Dame Alumni Club of Dallas Wynnewood Fellowship Church Yim’s Taekwondo ZRS Management We also want to thank Linda and Larry Long at Minuteman Press in Dallas (map) for serving as a collection location for the third year in a row. Here are just some of the photos of the coats as they were being gathered, sorted, and packed for shipping that afternoon to Buckner Center for Humanitarian Aid and Disaster Relief, where our very own New Hope Foundation co-Director Reverend Johnny R. Flowers is already overseeing their distribution to our less advantaged neighbors. [alpine-phototile-for-flickr src=”set” uid=”95046101@N07″ sid=”72157637364516613″ imgl=”fancybox” style=”wall” row=”4″ grwidth=”800″ grheight=”600″ num=”200″ align=”center” max=”200″ nocredit=”1″] [alpine-phototile-for-flickr src=”set” uid=”95046101@N07″ sid=”72157633465621190″ imgl=”fancybox” style=”wall” row=”4″ grwidth=”800″ grheight=”600″ num=”200″ align=”center” max=”200″ nocredit=”1″] Also, please see our other Family Focus Programs.